The Rollo company was early in the field as a cyclecar maker. Initially they offered two models, a monocar powered by a 4 1/4hp single-cylinder Precision engine and a tandem 2-seater powered by an 8hp JAP engine. Both models had belt final drive and tubular frames. 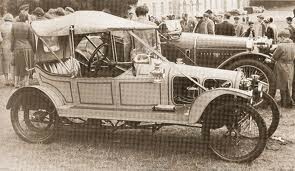 The monocar, which weighed only 336lbs, was modestly priced at 70 guineas (£73.50), and the 2-seater cost £99.75 with tandem seating or £105 with side by side seating, which was introduced in 1913.